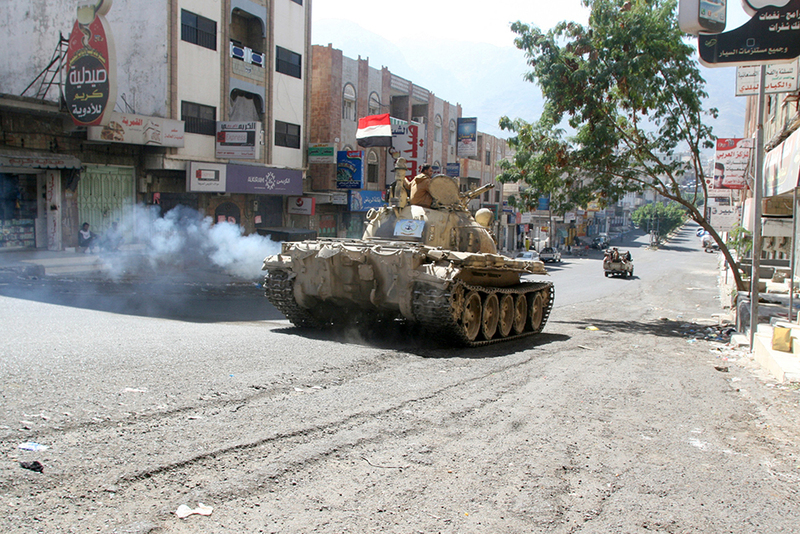 Al Mukalla: At least 20 Al Houthi fighters were killed on Tuesday in intense clashes with the government forces in the southern city of Taiz, a senior army commander told Gulf News. Army troops backed by allied tribesmen launched a major push to dislodge the rebel forces from strategic locations on the eastern side of the city so as to lessen their siege that suffocates the city. Colonel Mansour Al Hassani, a spokesperson for the Supreme Military Council in Taiz, said that his forces purged Al Houthis from some regions in the early hours of the offensive and are pushing to completely liberate other remaining areas in the coming days. “We have taken control of Saleh district that overlooks the presidential palace and other important locations on the eastern edges of the city,” he said. An Al Houthi field commander known as Abu Bassam and three government troops were killed in the clashes. Tuesday’s offensive is part of a larger military operation aimed at pushing the rebel forces out of the country’s third largest city and putting an end to the miserable humanitarian crisis caused by Al Houthi siege and shelling. The large operation was launched in August when the latest round of peace talks ended without reaching an agreement. The government forces liberated the western side of the city and announced partially breaking Al Houthis’ siege. Al Hassani said the second phase of the operation began on Tuesday and will focus on expelling Al Houthis from the eastern side of the city where key government institutions like the presidential palace, college of medicine and Imam palace are based. “Our target is controlling the east side and cut off Al Houthis’ supply lines from Sana’a that come through Al Houban district,” he said. Al Hassani said that months of heavy air strikes by the Saudi-led coalition warplanes and attacks by the government forces have taken their heavy toll on the morale of Al Houthi fighters. “The militia has fled the battlefield leaving behind their arms,” he said. Army commanders say they have recently received a new batch of arms and ammunition from the Saudi-led coalition. If the government forces advanced further and liberated the eastern side of the city, the rebels would be under siege on the southern and northern sides of the city and these fresh territorial gains would enable the internationally supported government to negotiate with the rebel movement from a position of strength, observers said. Similar heavy clashes between the two sides occurred on Tuesday in the northern provinces of Hajja, Baydha and Marib.